A doctor described by his colleagues as passionate, dedicated and a champion for stroke services in Wales has received the inaugural Welsh Stroke Excellence Award. 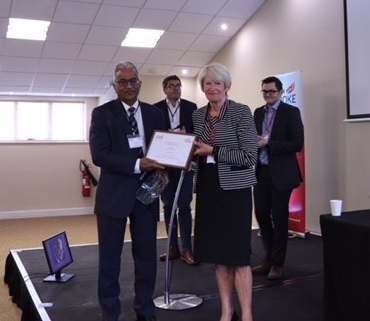 Dr Hamsaraj Shetty, a consultant in Stroke medicine at Cardiff and Vale University Health Board picked up the first ever award at this year’s Welsh Stroke Conference. The new awards were launched for the 2018 annual conference and aims to recognise those practitioners in Wales who are providing high quality care to stroke patients and have excelled in the field of stroke medicine in both a national and international arena. Dr Shetty has worked within stroke services for over 30 years and was selected due to his substantial contribution to stroke services not just within the Health Board but throughout Wales. Dr Shetty has spent his career delivering care of the highest standard to his patients and has done so with respect and dignity to patients and staff alike at all times. He has been inspirational in developing services in Cardiff and Vale University Health Board and his commitment and input to developing services in Wales has been substantial. Colleagues also describe him as a giant, an ambassador but also a colleague and huge advocate for multidisciplinary working and an inspiration and has created a lasting legacy. Future awards will have recipients chosen from nominations made from those working within stroke units in Wales with individual and team awards being given to those leading the way in delivering and developing stroke care in our proud nation. The 2018 award was kindly sponsored by Silverlink.